Are Businesses Drinking the Social Media Kool-Aid? 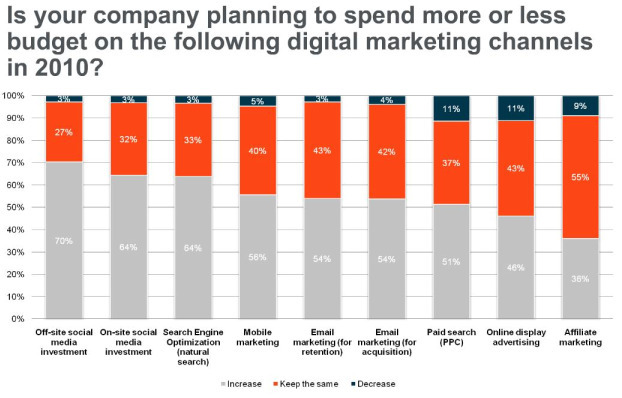 E-mail marketing firm Exact Target, in conjunction with Econsultancy, has released results of a report on digital marketing budgets that shines some light on what businesses are planning to do this year - and not do. What's very interesting (and alarming) is that many companies have decided to spend their budgets on some marketing channels somewhat blindly. The survey included data from more than 1,000 respondents in December 2009 and January 2010. Of those, 648 are client-side organizations, and 385 are agency/supplier-side, both from the US (45 percent) and the UK (33 percent). When asked about their planned marketing spend on social media for 2010, 70 percent of respondents said they would increase spend on off-site social media (Facebook, Twitter, etc.) while 64 percent said they would increase spend on on-site social media (blogs, or ratings and reviews). Also, 56 percent say they will increase spend on mobile marketing. At the same time, just 54 percent said they would increase spend on e-mail marketing. 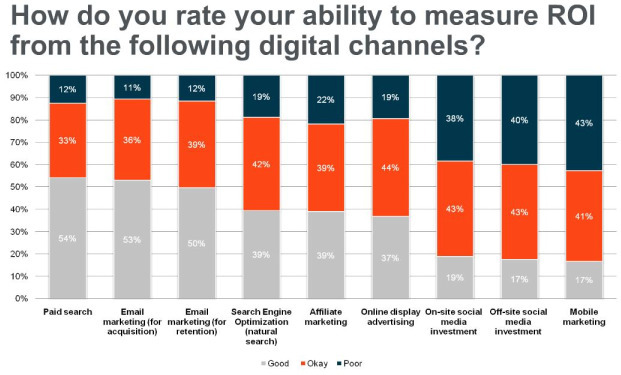 But when asked about measurable ROI for these channels, respondents appear to be rolling the dice. In terms of ability to measure, just 19 percent of respondents say that measurability is "good" for on-site social media and 17 percent for off-site. As far as mobile marketing, just 17 percent say that measurable ROI is "good." That's in stark contrast to e-mail marketing, where more than 50 percent say measurability is "good." It would appear that measurable ROI is much higher for a proven channel like e-mail and significantly less than social media or mobile. Either these businesses are measuring social media and mobile through unseen means, or they're drinking the social media Kool-Aid. Does this fall in line with your marketing budgets for 2010? Please leave a comment below and tell us if you're on the bandwagon, or sticking with what's worked in the past? And don't miss Website Magazine's upcoming April 2010 issue, where we address concrete strategies for e-mail marketing.